My husband, Don, has fished all of his life. Last year on a fishing trip, he saw something he had never seen. He saw from a distance what appeared to be red leaves floating in the river. Upon close inspection, he discovered it wasn’t leaves. Instead, each red patch was thousands of ants intertwined. These ants had been washed out of their home by floodwaters. They were holding onto each other and floating in order to survive. Don splashed water on the ants, and the water just bounced off. 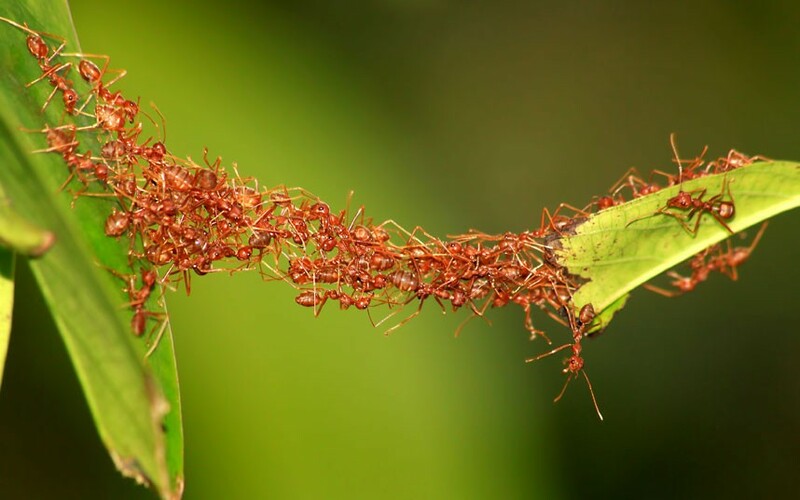 These ants were averting disaster by remaining close to one another. The ants display a picture of the church! Believers need one another. We need one another for encouragement toward righteousness and encouragement to stand firm in faith. We need one another to gain comfort and to share comfort that God has given us in our time of need. (2 Corinthians 1:3-4) Other believers are used by God to teach us and turn us from sin. Let the word of Christ dwell in you richly as you teach and admonish one another with all wisdom, and as you sing psalms, hymns and spiritual songs with gratitude in your hearts to God (Colossians 3:16). When Jesus ascended to heaven, He did not leave us alone. He gave us the Counselor, the Holy Spirit. (John 14, 16) But God also gave us one another. And so, may we ponder these questions: How intertwined am I with other believers? What am I doing on a regular basis to gain encouragement toward godliness from others? How am I allowing God to use my words to encourage other believers, bring them comfort, or deepen their faith? Lord, keep us faithful to meet with other believers so that we can gain encouragement and strength.